After seeing the awesome new trailer for Link Between Worlds, I was moved to download A Link to the Past from the Wii Shop and relive the 16 bit glory of one of my favorite Zelda titles. 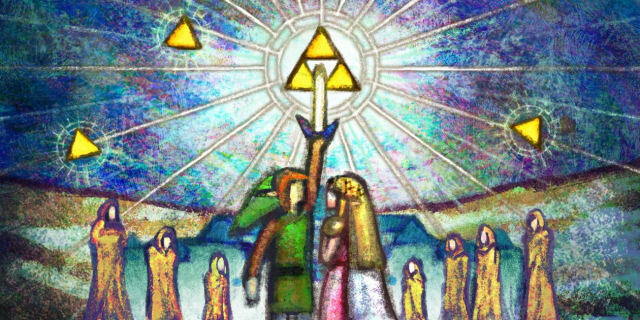 This got me thinking about how the upcoming 3DS Zelda title has the potential to be something truly special. For a start, I realized what a powerful (perhaps even somewhat manipulative) tool nostalgia is. For example, I think one of the reasons so many people cite Pokemon Gold/Silver/Crystal as their favorite gen is because of the nostalgia fueled return trip Kanto from the first game. Everything was very much the same but… different. There was a joy in traversing the familiar locales and spotting what had changed over time. And so as I play through LTTP again (for probably the hundredth time) I breeze through because I know it like the back of my hand. I know every secret, every nook and every cranny in such detail that the chance to revisit that same over world, but slightly altered over the years excites me beyond measure. I suspect that I am not alone in this. On top of this, we can no doubt expect dozens of references to LTTP, be it characters, items, dungeons or music. Anyone who played the SNES classic will doubtless be smitten just on the fact that LBW is a sequel. Of course, trying to make a good gaming experience through nostalgia and references alone would not make for a satisfactory game. Fortunately, Link Between Worlds looks set to shake up the Zelda formula in the biggest way since, well, since A Link to the Past. Not only does it have a completely new Dark World in Lorule (no one strained any brain cells at Nintendo there) to complement the familiar Hyrule, we have new items (always a standard but welcome addition to a new Zelda), intriguing new characters (hopefully, one of them won’t turn out to be Ganon). But above all, what has me so excited about this new game is shake up of the age old Zelda formula; That you have to complete dungeons in a certain order. While I have never had a problem with the series’ formulaic approach, I will welcome this change with open arms, for the level of freedom and challenge this shake up will bring. It’s for these reasons that I think A Link Between Worlds absolutely has the potential to be the best Zelda ever. While it promises to completely reinvent decades old aspects of the franchise, it also looks to have an unrivaled air of familiarity,ensuring that no matter how different things get, it will be unmistakably, The Legend of Zelda. Nintendo Announce A Link to the Past 2! If it wasn’t my job to actually inform in some way, I would be reporting on this by simply smashing my head on the keyboard until I passed out and hope that someone would come along and click publish for me. Yes, Nintendo have announced a sequel for game that is nearly twenty years old. Zelda has never really been big on linearity I suppose. While many were hoping for news of a 3DS remake for Majora’s Mask, this announcement has surprised fans everywhere, despite Nintendo previously stating that they were keen to see how ALTTP’s top down world would look with depth and height. Now we know. Glorious. The game, which currently has no official title, will take place in the same world as the SNES classic, A Link to the Past but is by no means a remake. The trailer demonstrates a curious ability Link now has to become a drawing and slide across walls, as well as showcasing classic items like the bow, mallet and sword and shield. Obviously. Zelda 3DS (Or ALTTP 2) is scheduled for release holiday season 2013. Praise be to Nintendo.